Hi there! Today i wanna share a real life example of dependency Inversion with you. In my RCP-Client developer career we had often the challange that due some customer change requests, we were forced to instantiate some domain specific dialogs from base. The problem here is that base (package: com.yourcompany.base) is not allowed to create dependencies to domain specific packages. So how could we solve this problem? We must inverse the dependency. What do we need? 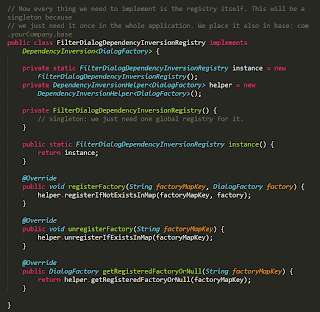 We will create a dependency registry in which we register domain specific dialog factories to be able to instantiate them from the base without having to create dependencies from base to specific domain packages. 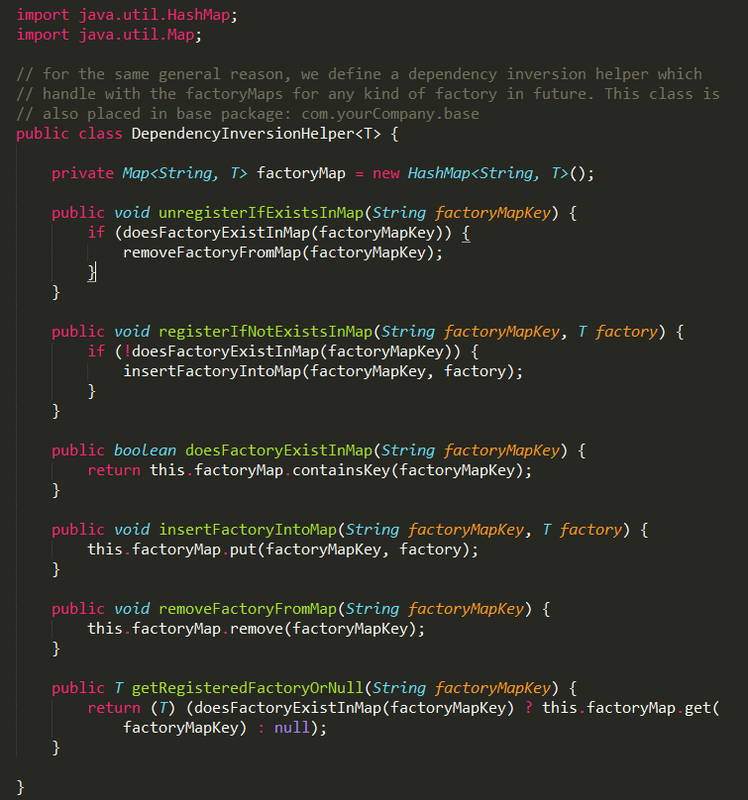 We define a factory interface in base. Let's say package is called: com.yourCompany.base. 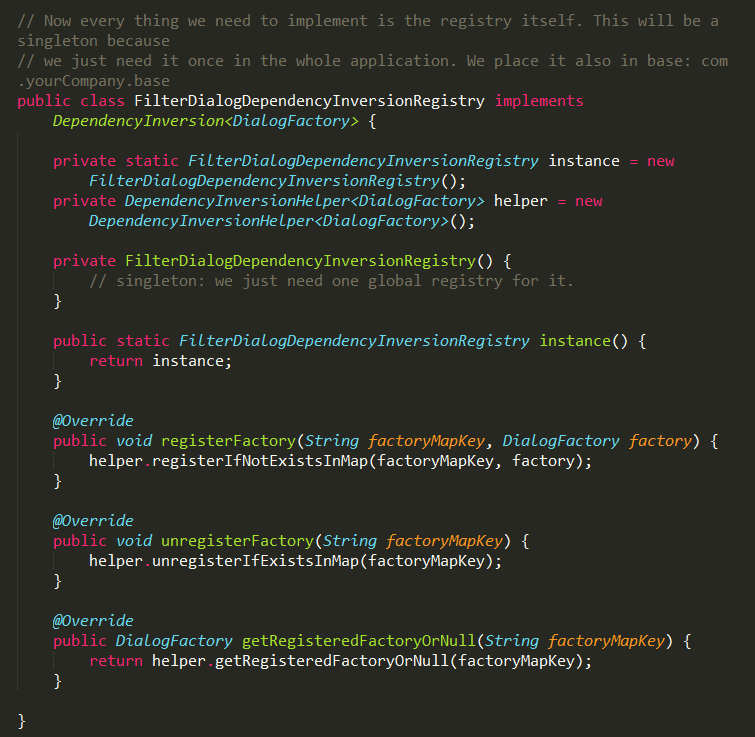 // then we define also in base the interface for DependencyInversion in general. // singleton: we just need one global registry for it. Now we are able to register all factories we need with this registry. 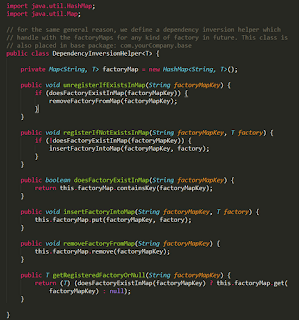 Because this registry is visible in base and in any other domain specific package, we can access our new Registry from anywhere and get the factory we need for any factoryMapKey we define. In Eclipse RCP this is usually done in the method start() from the application. when the method getRegisteredFactoryOrNull(key) is called, we get a DialogFactory and are able now to call the method createFilterDialog() from it. What it happens now is very cool. Any interface knows its implementation and creates the right dialog without having dependencies to the base modul. Any domain specific factory must only implement DialogFactory. That's all.